Litha, meaning “longest day” in Norse or Anglo-Saxon, falls around June 21, though it can be anywhere from June 20 to June 23, depending on where the longest day lands in that year. It is also referred to as Midsummer’s Day or the Summer Solstice. If you live in the northern hemisphere, then you look forward to the longest day of the year and the warmth that comes with it. This day, however, brings with it an undercurrent of sadness, as the sun immediately begins to wane towards winter again the following day. Litha is one of the minor sabbats and, since the celebrations focus on the position of the sun and its influence on the harvest and all of life, it is categorized as a solar celebration. 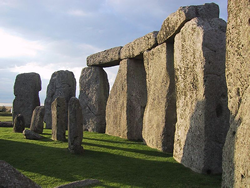 Stonehenge, configured to track the position of the sun through the seasons, attracts pagans who go there for midsummer ritual celebrations. According to Jeff McQueen, First Degree Priest with the Wiccan Church of Canada, for pagans living on the heath, the focus was always on what the crops were doing and, while Stonehenge might have been used as a way to track the movement of the stars, for pagans trying to survive until the next ritual, the concern was less on what was going on astrologically and more on what was affecting the crops. Louise Bunn outlines an alternative interpretation in her Book of Shadows: Participant’s Handbook for Paganism 101: “Within the longest, brightest day is the seed of decay and death, just as the darkest, ‘deadest’ day contains the seeds of life and growth.” She goes on to say that in ancient Britain, on Midsummer Day “the Oak King was ritually killed and the Holly King crowned.” (Bunn, 61) It was during this festival that they had the burning of the wicker man. Bunn, in Book of Shadows, also suggests having a bonfire. Other activities she recommends include making a solar cross, performing a protection ritual to keep pets or livestock safe, gathering herbs, which have extra potency at this time, making and burning a wicker man or re-enacting the Oak King-Holly King battle. Late June in Ontario brings the ripening of strawberries and currants. Raspberries are just around the corner. The harvest begins to come in, though, at Litha, there is still a lot of growing to do for many crops before everything finally comes in around the time of September’s Mabon, the ritual that follows August’s Lammas. Ritual at this time might include berry-based food and drink, or anything that brings to mind the sun, such as sangria with lemons and limes. McQueen also suggests hot, spicy foods and drinks, such as spiced wine or orange juice with spiced rum. Tony and Aileen Grist incorporate a round loaf to symbolize the sun in their Midsummer Solstice Ritual in their book The Illustrated Guide to Wicca. Any round foods work well as a representation of the sun, either within ritual or at the potluck that inevitably follows it. Strawberry pie incorporates both the symbolism of the sun and takes advantage of the fresh, local strawberry harvest. Yule, one of the Lesser Sabbats, sits opposite to Litha on the Wheel of the Year. At Yule, the sun is at its weakest in the northern hemisphere and we have the longest night. Beltane precedes Litha on the wheel. A fire ritual, it marks one of the two times during the year when the veil between the worlds thins, allowing spirit energy that is light and playful to cross easily into our plane. Lammas follows Litha on the wheel and is a time of harvesting and reaping what you have sown. McQueen compares Midsummer’s Day to the pause in the breath after an inhalation. Litha is the very peak of the ascent to summer, where we pause and then begin the giddy descent down the other side. Despite the knowledge that we are journeying towards winter again, we still have the hottest days of summer ahead and the bulk of nature’s bounty yet to harvest. Besides, we are finally able to go barefoot in the circle and are armed with a candle to light our way through the darkest times to come. Grist, Tony and Aileen, The Illustrated Guide to Wicca, New York: Sterling Publishing Company, 2000.